Main Event: "Yoga Monster" Mike Sydal vs Taya Valkyrie. 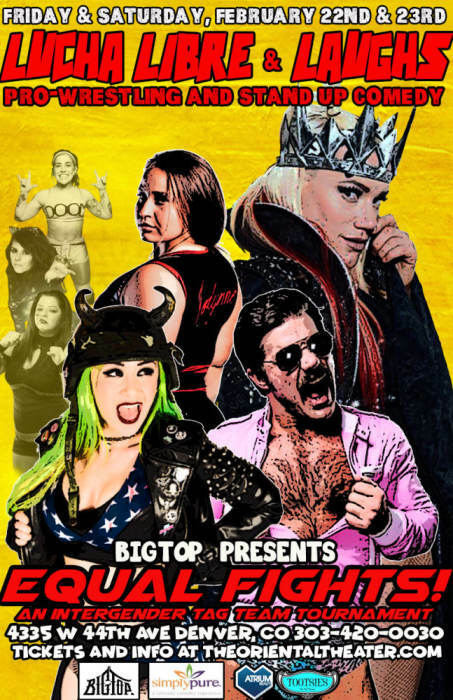 Intergender tag team tournament, featuring Delilah Doom, Shotzi Blackheart, Ruby Raze, Anaya, Lonnie Valdez, and more. Commentary by Nathan Lund and Sam Tallent. 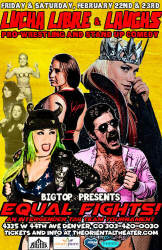 Lucha Libre & Laughs brings Pro-wrestling and stand up comedy together for one great show in Denver, Colorado! Westword, best of Denver. Best Comedy Night in Denver 2015, 2016, 2017, and 2018!